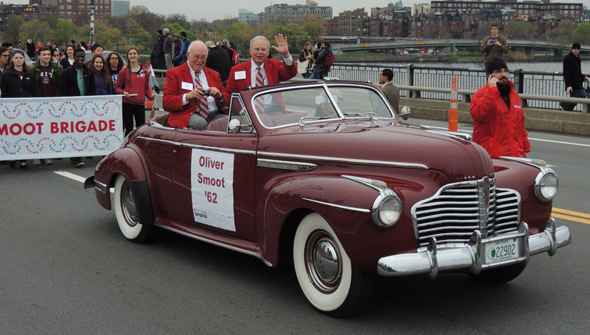 Oliver Smoot, the man who became a unit of measurement, was back in town today to serve as grand marshal of the 100th anniversary of MIT's moving day - the celebration of the school's moving from the Back Bay to Cambridge. 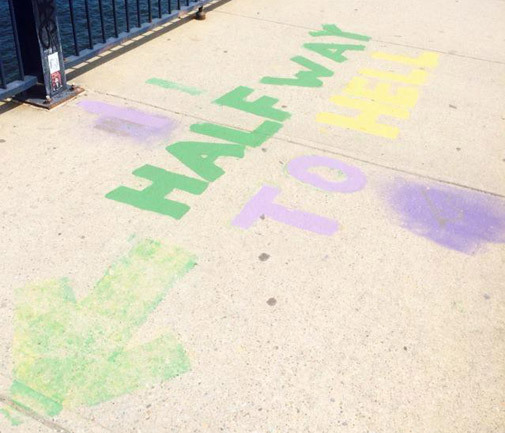 RoadTrip New England snapped him as he rode past the markers bearing his name on the bridge. Curt Nickish caught him being measured to make sure he still had an ear (the bridge being, of course, 364.4 smoots long, plus or minus an ear): Read more. WBUR talks with Oliver Smoot, who gave us the measurement, back in town for the centennial celebration of MIT's move across the river. Troopers were able to bring the man from the water into a State Police vessel and transport him to a nearby dock, from where he was taken to Boston Medical Center. Based on the facts and circumstances available thus far, the incident does not appear to be the result of criminal conduct and the man is expected to survive. 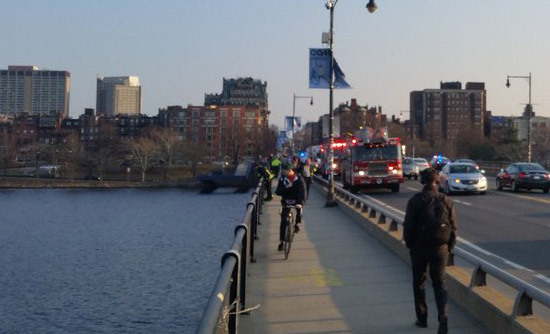 Tim watched some of the first responders searching the Charles around 4:30 p.m. Nick Gillham reported they were looking for somebody who might have jumped. Traffic was backed up in both directions. Bridge protest this morning. Photo by Lee McGuire. Upset over Uber, natch. 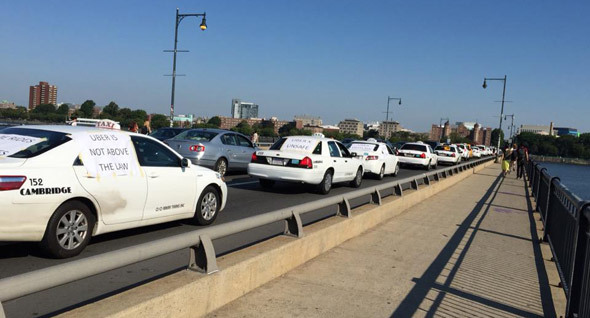 Shortly before 9 a.m., cab drivers blockaded the Mass. Ave. bridge into Cambridge. 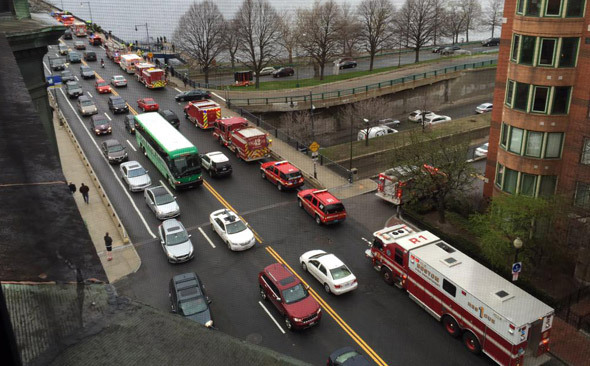 "Completely gridlocked traffic downtown," Christine Peterson reports. The scene on the bridge. Photo by WhiteHotOven. 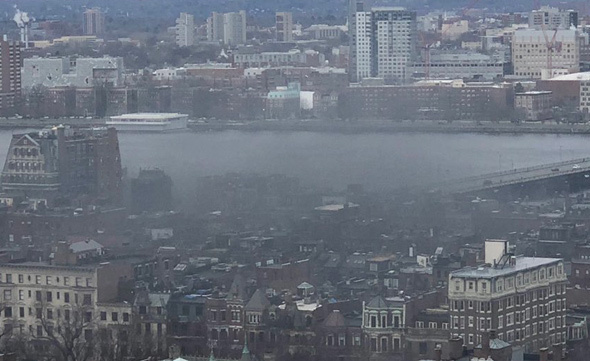 The Boston Fire Department responded in force around 6 p.m. when a report came in of a possible jumper from the bridge, but after searching the water, firefighters found nothing and left. Shortly after 4 p.m., Boston and Cambridge firefighters and Boston and State police began rushing to the Mass. 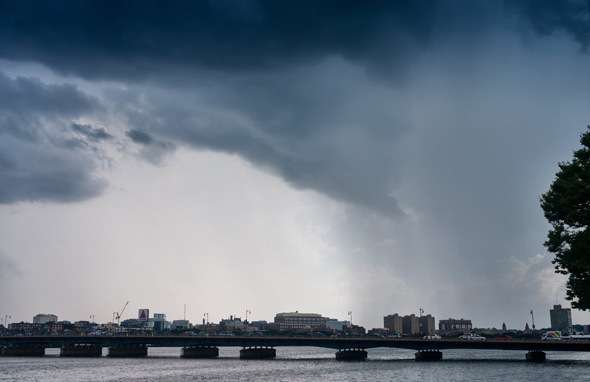 Ave. Bridge on a report of a sailboat tipping over in the wind and dumping somebody in the water. Just as firefighters were about to begin their "tech rescue," however, the person managed to get back in the boat and make his way to shore on the Cambridge side - where he was met by troopers and Cambridge firefighters. He declined medical attention. Don't they say Boston is the most European of American cities? JB Parrett highlights the Mass. Ave. Bridge. Think the Hood Blimp could lift the Oscar Mayer Wienermobile? David Cole spotted the Wienermobile on the Mass. Ave. bridge around 6 p.m.